Among the indie stars that have graced Nintendo platforms over the years, it's easy to say that WayForward's Shantae is one of the most recognizable. Despite playing the lead role in only three games over the past decade, the scantily clad genie has managed to dance her way into the hearts of so many gamers. The public's passion for the character was proven in the autumn of 2013 when WayForward took to Kickstarter to fund its latest entry in the series and the funding goal was subsequently smashed and nearly doubled. 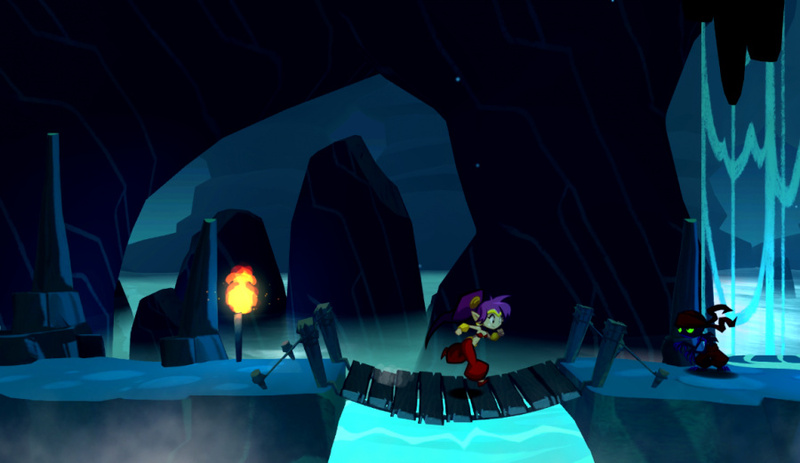 Fast-forward to now, nearly two years after the completed fundraising campaign, and we've finally gotten our hands on an early build of the forthcoming Shantae: Half-Genie Hero. Don't be fooled if you're one of the lucky Kickstarter backers who have access to the E3 build that went out in early June. The game that we had the opportunity is the same one that you've already seen, but we had the chance try it out for the first time on the Wii U. The stages and content are all the same, but being able to play on Nintendo's home console made the whole experience feel more concrete, pushing us the one extra step closer towards a finished product; it's one that – after playing – we're really looking forward to. There was very little information available to us regarding the game's plot at the time of playing. We were informed that familiar characters and settings will be present, but this is more of a side-story for the beloved hero. While not necessarily working as a reboot for the series, Half-Genie Hero is designed to reintroduce the world of Shantae to new players, a decision that makes sense when considering how young some video game players today were when the character first made her début. From what we could gather, this title doesn't just re-establish Shantae as a character, but the whole experience has been brought forward and modernized. It's been shown in gameplay trailers, but Half Genie Hero ditches the series' traditional flat 2D appearance for more robust environments. The gameplay remains a side-scrolling experience, and the flat characters are beautifully animated within them, but this time parallax scrolling has been employed, giving the game a 2.5D appearance. This isn't the first time we've seen this from a WayForward game, however, and we were able to confirm that Half Genie Hero is being built in the same engine that was used for DuckTales: Remastered. Of the three stages that we saw none looked particularly dynamic, but it was nice to see a familiar landscape reimagined. As is a staple with platformers coming from WayForward, the controls here are exceedingly tight. From jumping across chasms to whipping her hair at unsuspecting foes, Shantae controls incredibly well, making for an excellent action experience. The control scheme has been kept simple, employing the left stick to control movement and the lettered buttons to jump and attack, exactly what we've grown comfortable with in a game from this series. Of the three stages at our disposal, two were more focused on platforming while the third was an action-intensive automatically moving stage, not unlike a Donkey Kong Country Mine Cart level. The controls remained stable and dependable throughout each, despite featuring different forms of gameplay and having varying demands. It's clear that the controls were designed with simplicity and precision in mind. Being an early build, the Wii U's GamePad functionality wasn't put to any significant use, but we were informed that options are being considered. As of now the only functionality that we saw was off-screen play and the option to use the touch screen when selecting stages, fairly standard yet still appreciated inclusions with most Wii U games. It's unfortunate that we weren't able to see any true Wii U specific functionality, but, as stated earlier, being able to play this build on the home console rather than a PC makes the experience that much more real. From what we played of Shantae: Half-Genie Hero on the Wii U, development looks like it's on the right track. The stages available looked good and played well, but the build that we had our hands on still felt very early on in the process. It's obvious that there's still a lot of work that needs to be done, but we're remaining optimistic. We're now almost a year past its initial targeted release of October 2014, but the good news is that the game hasn't been delayed without reason. The team behind Half Genie Hero is taking its time to make this game as polished as it can be, and we're happy to report that it's shaping up quite nicely. Disclaimer: The author of this article helped fund Shantae: Half Genie Hero during its initial Kickstarter campaign, but that in no way influenced their opinion of this early build. Lol "but that in no way influenced their opinion". The point about disclosure is that you're not capable of determining whether it influences your opinion or not, so you're letting the audience make their mind up with all the info! "...but this time parallax scrolling has been employed, giving the game a 2.5D appearance." That phrase, "parallax scrolling", does not mean what you think it means, since the previous Shantae game--and countless thousands of others all the way back to at least Moon Patrol in arcades--used it. "Parallax scrolling is a technique in computer graphics and web design, where background images move by the camera slower than foreground images, creating an illusion of depth in a 2D scene and adding to the immersion." I have to be honest...ive lost track of these games. Wasnt there a HD Remake of the second game planned ? The thing is, i havent bought the DSi game yet, since i heard of a remake. I've never understood why people ever use the analogue stick over the D-Pad in a side-scrolling game. It exists. Just, not on a Nintendo platform. And it's been out for about a year. On the plus side, it's spec requirements are low. @Genesaur because they are probably 15 years old and didn't grow up in the nes/snes era. The stick for a 2d side scroller? Lol. It's all about he dpad. 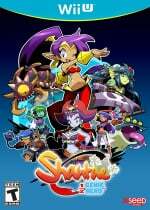 I had no idea that Shantae had more then one game. I've never played a Shantae game before and despite watching a few videos on YouTube, never fully understood what the appeal was. I'll be honest: I was never interested in the series (though I have played the first and Pirate's Curse), but for some reason, Half-Genie Hero got me interested that I want to actually play it now. @DarthNocturnal It was confirmed for a Wii U and 3DS eShop port awhile ago for a 3Q release, but nothing's been heard since. Probably one of the most overrated gaming series to come out of one of the most overrated video game developers. WF did a wonderful job on Contra 4, but everything else that I've played of theirs typically runs luke warm. BTW, Shantae and the pirates curse 'visually' speaking looks a lot better than this....the bite sized and incredibly detailed pixel graphics beat the crap out of this latest sequel. The environments look too barren. WF should take a cue from wario land shake it! "but that in no way influenced their opinion"
I'm with @Dezzy on this one, thanks for the disclosure but don't expect us to believe you had no influence whatsoever. Wow, this is the first time I've seen a Shantae game that looks to be a lot of fun! @MJKOP Heck, I actually use the D-Pad for some 3D games. Not usually, but sometimes. REmake comes to mind. Still have yet to play any of the games in the series though I have always been quite interested in them. Next time there is a sale maybe I will take the plunge! I've gotta say, the new art style kinda disappoints me. I really liked the old pixelated look. Because DPad is more responsive. One push and you know it's moving where as on the stick, you have to be sure you've pushed/tilted enough to trigger the movement. I think the remake is on PS4, if that helps. Glad to see that game is turning out well. I may get this on the Xbox One though. I don't think contributing $15 is going to make a person biased to say the game is better than it is. Especially someone who makes it a point to remain unbiased in the interest of the readership. I funded this game and I'm not going to sit here and make it sound better than what it is just because I threw a few dollars to help fund it. If I say it looks good it's because it actually looks good. I funded Mighty No 9 and am not afraid to voice my disappointment with how it's turned out ( particularly that stupid tag and dash mechanic). Just because someone gives a few dollars to see a game developed does not mean they all of a sudden have motive for bias. There is nothing to gain by it. @Einherjar A Director's Cut is coming to 3DS and Wii U. Not sure when or what the differences are, but I'm sure NL has some articles on the subject. Is Shantae really an 'indie' character, though? The first game for GBC was released and published under the Capcom label, so that could be debateable. I should get to this series sometime. I understand that some people prefer the pixelated look but this new style appeals to me a lot. Looks fun. @MJKOP yeah man I gave my girl the classic controller to play Mario world on th Wii and I tell her to use the dpad and she used the stick. Maybe the stick is more natural to use but imo less accurate for 2d games. @Genesaur yeah I was generalizing which isn't good but still I'm sure most that prefer the stick are younger. Played the DSi game and never got around to finishing it, has a certain charm about it though. Will definitely pick up Pirates Curse when it goes on sale, as for this new entry will have to wait and see, quite a few other games higher up on the list. @Kobeskillz That is exactly true as that is the scenario for me. Especially when it's in a not so natural place like on the gamepad, I won't use it. Thanks for the reply. Being a musician in a band that is signed to an indie label, I thought that, maybe, the same rule applies to video game characters. Shantae first appeared on a big-time label...Capcom. WayForward has been publishing Shantae games on their own since then, so technically she can be considered an 'indie' label character. But that's kind of like when Led Zeppelin published their own records on their own label (Swan Song Records). I'm sorry to say, but they were never an 'indie' band. That's just my logic on the whole thing. Thats the game i was talking about, but since its not on a Nintendo platform, i kinda lost track of it and got a little confused. Well, if its still on the way, ill wait a little longer. I would want to have them all under one roof and not scattered across multiple systems. @WaveBoy I have to agree honestly. The first game I didn't like, the second one was meh, and the third one is much better but still not a must have. @Genesaur HAHA I can't it ruins my accuracy! Super excited for this. Glad I backed this instead of Mighty No. 9. Getting it for PS4, but I'll probably purchase it on other platforms as well if it is great. @spacejump Feels fine to me. Doesn't bother me one bit. Yeah, the GBC original was an absolute snore. I do like Shantae 3DS's visuals and stereoscopic 3D effect, but that's honestly where the love ends with me I'm contemplating weather I even want to stick with it or not. Most of the 3DS's eShop releases as it is are heavily overrated. Three words. Gun man Clive. @WaveBoy Gunman Clive is actually two words Even if that was the joke, it may be overrated but at least you're not overpaying for what you get. That helps it; it may not be amazing but it's a solid title and I never felt ripped off with it's price. I thought the second Gunman Clive was more disappointing because where others see 'variety' in the levels I see ideas mashed together that don't fit well and a less cohesive game. As for Shantae, the first I find really dated and nearly unplayable at times. The other two are better. It's the Mighty series I find more overrated though. I actually can't stand the original game, but Pirates Curse I picked up during the recent sale and now I'm considering getting the steam version of Risky's Revenge. I'd rather play it on a console but it's only on DSiWare through the 3DS eShop and it's more likely to see a good sale and is already a couple bucks cheaper on steam for the Directors Cut. I was hoping this Shantae would be a retail release, but I'll settle for eShop on my Wii U.
Pirate's Curse was my first Shantae game, and I loved it! I'm looking forward to this game; it's looks really fun! I'd give anything for a physical copy of this game. And a Shantae amiibo now I think about it. And a playable character in Smash Bros. Anyway, anyone else getting a Wonderboy the Dragons Trap vibe from this. Its strange to see quite a few negative comments on the shantae games because it kind if jars with my experience. Played the most recent one (pirates curse) on the wii u recently after getting it on sale and in retrospect would have happily paid full price. Guess not many people realise what the gameplay is actually like until you play it -just a really tight well designed metroidvania with great character and humour. Don't get whats not to like? I then bought the 2nd one on dsi through my 3ds (i know its getting a bit of a hd remake but i couldn't wait). Not quite as good as the most recent one but still great. Started on the gameboy colour game then- not amazing just solid, but it still had a certain charm and still better than most gb games. TL:DR buy the 2nd and 3rd games if u like metroid or tightly designed platformers. To clarify the 'indie' 'major' debate, major is (in any sense) when a first party proponent of a major label / studio creates the IP (intellectual property). Hence, the Simpsons are a major studio production. Now, if a dozen guys in their basement made the Simpsons and Fox showed it on their channel, then it would be an indie studio production. Production is what should determine label, not distribution. In the case of the GBC game, a major had to distribute the game. It would have been impossible otherwise. Until the Wii / DSi, indies were locked out of Nintendo's systems. Sony never opened things up until the PSP started the digital gaming distribution craze and then.. distribution comes up once more. There are so many tiny indie record labels that found legitimacy and substance by starting out as distributors and some stayed that way. Capcom had a nice little streak where they incorporated new and diverse ideas and helped smaller studios find their way forward (pun intended). It's almost like a 2nd party partnership, but with a developer and not a hardware manufacturer. And I'm certain that Capcom isn't the only one who does it. Note: this is nowhere near the same as EA / Bioware. That is a partnership born of a business deal that merged the two entities. What Capcom and WayForward have done in the past is a licensing and distribution deal. NOW, with Ducktales, the developer may have been indie, but the property was of a major studio and Capcom provided budget supplementation (received partly from Disney themselves). In that case though, WF was simply outsourced by a major studio. I'd say that any band that is still signed to a major label is a major label band, any band signed to an indie label is still an indie label band. Regardless of history or past success. The term 'indie band' is a bit misleading, as it could refer to any given aspect of the band's outlook but often does not refer to the band's position in the industry. For me, an indie label is any label that requires an outside source for ANY aspect of distribution, outside of it`s home demographic. Even in most of the examples given, it`s not like in video games. A video game is not a living, breathing collection of vulnerable human beings. It is data, a compiling of effort, yes, but it is just numbers and code at the end of the day. With many indie bands, the issue of foreign distribution often comes down to the band (or the band`s agent). A game won`t ask to be distributed to a foreign market, the developer has to do that themselves. And while we see indies petitioning majors for these sorts of distro deals, a major can also become aware and interested and offer those sorts of services themselves. Anyone who followed Shovel Knight`s road to release can attest to the fact that sometimes, it would be extremely helpful to have a major label`s support but from the devs perspective, it can be all the more satisfying to do it yourself. On topic, I much prefer the fully realized characters in this game than the previous iterations` pixel sprites. The backgrounds lack a bit of the Shantae charm, but coupling the action with the crisper, clearer, better animated characters makes for a much more immersive experience. In my opinion, this game still bests the games that came before it and what few flaws and faults I could find in the prebuild can be easily remedied by a coat of polish. @JaxonH Of course it can. The fact that you've already "bought" it means you have a much heigher desire for it to turn out well. And once again, someone stating that they're not biased is completely and utterly meaningless. That's not how bias works. Two years later, and they're still on an early build? Guess we won't see this until 2016 then. @Waveboy Well, it is an early build. I'm sure they'll add more detail later. If it's the art style itself you dislike, then oh well the graphics just aren't your preference. Anyway, I'm glad to hear the game is coming along well. I love this series and gladly contributed to this game's Kickstarter. @Genesaur In terms of control, I can't disagree. However, as a big man with big man hands, I find my thumb automatically settles on the stick.
" The fact that you've already bought it means you have a much higher desire for it to turn out well"
We are all gamers, and we all have interest in games. But having interest in a game- having a desire to see it turn out well- that's not evidence of irrational slanted bias. I can want something to turn out well and still be completely honest about whether it is or not. I mean think about it, a person reviewing a game should have interest in it turning out well. Because if they don't then they probably don't care about the game and that means they're probably not the right person to review it. We're humans, not robots. Of course we're going to have desires to see things turn out well. But that doesn't make us delusional about the reality of whether something is. On the topic of whether or not to use a Dpad: I first determine if the game is reading it as a digital or analog input. Tilt the thumbstick ever so slightly until your character moves. Now push it all the way to the edge. If you character speeds up, it is analog control and you should use the stick. If your character moves at the same speed regardless of how far you tilted, then it is digital and you should use the Dpad. Platformers designed for analog movement tend to be clunky when controlled only by the Dpad, especially in 3D. Special case for Super Mario 3D Land/World where Mario essentially moved at constant speed regardless of how far the stick was tilted, but there were about 16 or so discrete directions Mario could travel in. Only 8 of these were accessible via the Dpad.